Wilson Fisk’s plan to crown Dex as New York City’s newest villain is full steam ahead in the latest edition of Daredevil. Fisk’s manipulation has the FBI agent on a path toward a psychotic break, but Matt has a plan to expose Fisk’s plot. However, the question remains: which side will be one step ahead of the other? 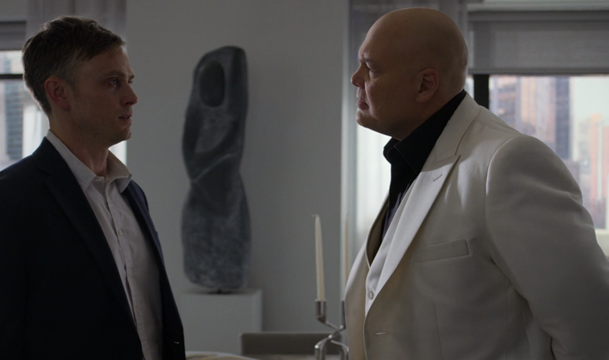 As Fisk’s quarters get a very Kingpin makeover, Dex struggles to calm his homicidal thoughts. When his therapy tapes don’t work, Dex comes into work early, though it does little to quell the flood. Dex confronts Fisk about Julie, believing he brought her to the hotel to mess with him. Instead of addressing Dex’s question, Fisk tells him about how he murdered his father with a hammer as a child. The share a common bond in their violent youths, but where Dex was taught to hide himself, Fisk’s mother showed pride in her son’s action. Fisk tells Dex he didn’t lose Julie because he never had her, that society punishes people like us. Dex’s exit coincides with his discovery that the internal investigation into him is front page news due to an anonymous tip. The news forces the FBI to put Dex on leave, removing the rigid stability his therapist stressed he have. Even reassurance from Ray isn’t enough to quiet the growing voices bouncing off the walls of Dex’s mind. A suicidal Dex receives a phone call from Fisk expressing his acceptance of Dex without shame. Fisk promises to not abandon him and that a gift will be arriving shortly. Karen, Foggy and Matt seem to be on the same page for the first time in what seems like forever. After Foggy encourages Karen in her internal struggle with Wesley’s killing, Matt visits Karen by breaking into her apartment. Matt informs her of Fisk’s feigned stabbing and asks for her help finding Jasper Evans. Karen initially refuses to help him, but changes her mind after discussing the situation with Foggy. The two realize they can’t turn their backs on a man that has dealt with as much loss as Matt. Their cooperation isn’t with conditions though as they offer to help him if he agrees to turn himself in to the FBI. Matt agrees and the band is back together. With the deal set, Karen seeks out Sister Maggie in an attempt to gain insight into Matt. Maggie details Matt’s trouble controlling his anger and abandonment issues, especially how quickly Matt shut people out. Maggie stresses that Karen hold onto Matt tighter. Karen tracks Jasper to a heroin den. Matt aids her in detaining Jasper while Foggy sets up a meeting with the FBI to expose the truth about Fisk. The three, with Jasper in tow, meet at the New York Bulletin offices in preparation for the meeting. Ellison even apologizes to Karen about keeping her off the Fisk story. All seems well when Matt hears screaming before the lights go out. 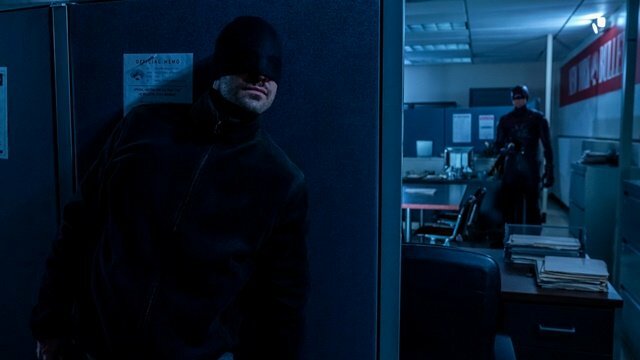 Under the cover of darkness, Dex appears in the Bulletin’s office wearing the Daredevil suit. He proceeds to murder multiple Bulletin employees with Daredevil’s weaponry. He takes aim at Foggy, but Matt, in his black hood, catches the Daredevil baton before it makes contact. The two masked men fight throughout the cubicle-ridden room. Dex’s uncanny marksmanship is on full display as he turns any handheld item, including office supplies, into a deadly weapon. 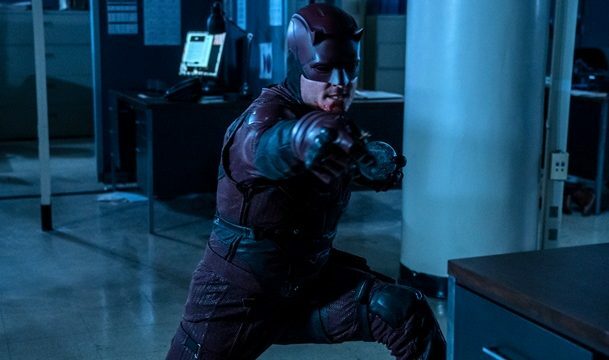 When Matt asks who he is, Dex identifies himself as Daredevil before the fight resumes. Matt’s best efforts aren’t enough as he falls after being stabbed with a pair of scissors and having a metal shelf pushed onto him. With Matt out of the way, Dex enters the room housing the others. Foggy tries to fight Dex off, but he easily tosses him aside before firing another pair of scissors into Ellison’s stomach and killing Jasper with Karen’s gun. The FBI arrives mid-attack but are unable to stop Dex’s escape. The lights come back on as Matt escapes the room, revealing the bloodshed to an entering Ray. The FBI agent is left to believe that Daredevil is responsible for the killings as Matt and Dex disappear into the New York City night. 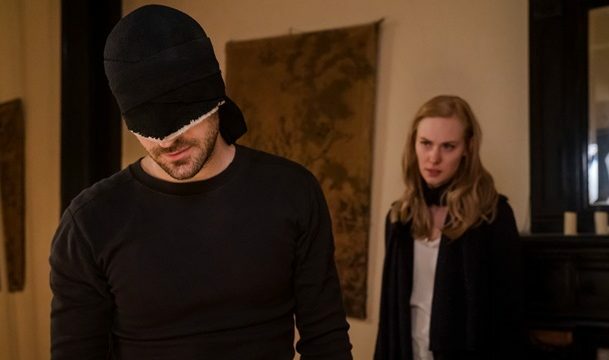 What did you think about Daredevil season 3 episode 6? Let us know in the comment section below!